Most tires naturally lose air over time. Tires can lose air suddenly when driven over potholes or other objects or if the vehicle strikes a curb while parking. The tire pressures should be checked when the tires are cold. The tires are considered COLD after the vehicle has been parked for 3 or more hours or driven less than 1.6 km (1 mile) at moderate speeds. Incorrect tire pressure, including under inflation, may adversely affect tire life and vehicle handling. Improperly inflated tires can fail suddenly and cause an accident. The Gross Vehicle Weight Rating (GVWR) is located on the C.M- .V.S.S. certification label. The vehicle weight capacity is indicated on the Tire and Loading Information label. Do not load your vehicle beyond this capacity. Overloading your vehicle may result in reduced tire life, unsafe operating conditions due to premature tire failure, or unfavorable handling characteristics and could also lead to a serious accident. Loading beyond the specified capacity may also result in failure of other vehicle components. Before taking a long trip, or whenever you heavily load your vehicle, use a tire pressure gauge to ensure that the tire pressures are at the specified level. Seating capacity: The maximum number of occupants that can be seated in the vehicle. Vehicle load limit: Refer to “Vehicle loading information” in the “Technical and consumer information” section of this manual. Tire size – refer to “Tire labeling” in this section. Cold tire pressure: Inflate the tires to this pressure when the tires are cold. Tires are considered COLD after the vehicle has been parked for 3 or more hours, or driven less than 1 mile (1.6 km) at moderate speeds. 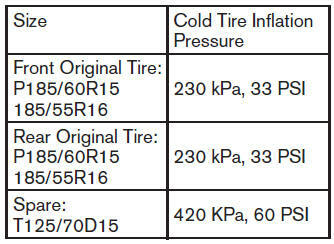 The recommended cold tire inflation is set by the manufacturer to provide the best balance of tire wear, vehicle handling, driveability, tire noise, etc., up to the vehicle’s GVWR. Original tire size: The size of the tires originally installed on the vehicle at the factory. Remove the valve stem cap from the tire. Press the pressure gauge squarely onto the valve stem. Do not press too hard or force the valve stem sideways, or air will escape. If the hissing sound of air escaping from the tire is heard while checking the pressure, reposition the gauge to eliminate this leakage. Read the tire pressure on the gauge stem and compare to the specification shown on the Tire and Loading Information label. Add air to the tire as needed. If too much air is added, press the core of the valve stem briefly with the tip of the gauge stem to release pressure. Recheck the pressure and add or release air as needed. Install the valve stem cap. Check the pressure of all other tires, including the spare.